CareMount Medical, P.C. is the largest independent multi-specialty medical group in New York State, providing comprehensive medical care of the highest quality to over 640,000 patients in more than 45 offices throughout Westchester, Putnam, Dutchess, Columbia, and Ulster counties and New York City. Founded in 1946 as Mount Kisco Medical Group, CareMount has grown from six physicians to over 600 physicians and advanced practice providers with over 40 specialties, making the group a seamless, “one stop shop” for patients. CareMount Medical is affiliated with world-class organizations including Massachusetts General Hospital, Mount Sinai Health System, and Memorial Sloan Kettering Cancer Center. CareMount Medical is wholly owned by its practicing physicians. The group is committed to remaining independent and views value-based contracting and population health as core pillars of a long-term growth strategy. CareMount Medical, P.C. continues to build an enhanced network of preferred providers from both the acute and post-acute care sides to support key care management functions for patients. 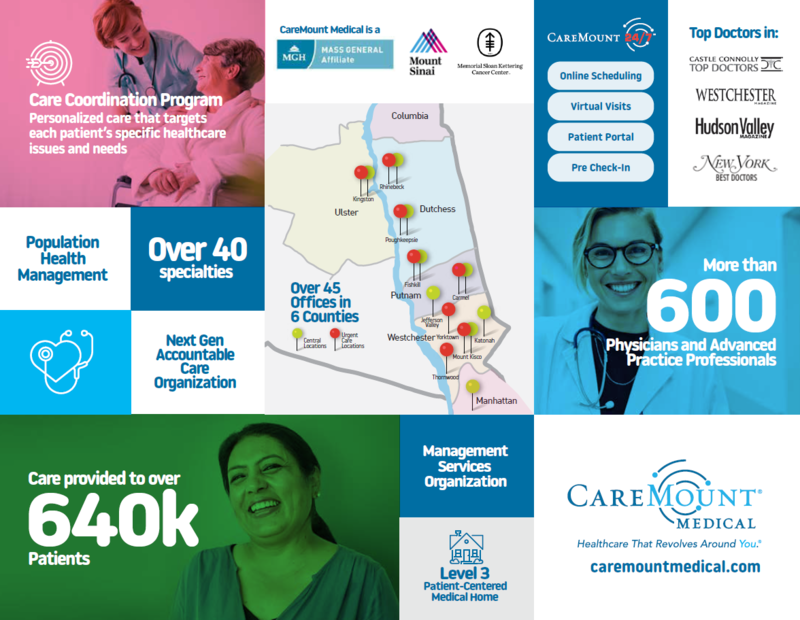 CareMount Medical’s Next Generation Accountable Care Organization, CareMount Health Solutions ACO, LLC, is one of only two Next Generation Accountable Care Organizations in New York State. CareMount Health Solutions ACO, LLC, formed in early 2018, is a subsidiary of CareMount Medical, P.C., which focuses on assuming risk and coordinating care for Medicare patients. For nearly a decade, CareMount Medical focused its strategic model on the shift from volume to value and as such it has been delivering coordinated, high-quality care that improves the patient’s experience and health while lowering overall healthcare costs. CareMount was also a participant in the Medicare Shared Savings Program Track 1 ACO. CareMount Medical’s 24/7 patient access platform offers live telemedicine/virtual visits, real-time on- line scheduling, pre-visit mobile/at home patient check-in, and a patient portal for patients to manage their care online. These standard technologies are offered to hundreds of thousands of CareMount patients. CareMount Medical owns and operates eight urgent care centers, clinical laboratories and radiology services, as well as endoscopy suites and infusion suites, rendering comprehensive care to newborn patients through adulthood in a multitude of locations with one electronic health record system. CareMount Medical’s Radiology Department offers the most advanced technology and provides a full range of imaging modalities, with subspecialty expertise in Body Imaging, Neuroradiology, Musculoskeletal Imaging and Women’s Imaging. CareMount’s NYS licensed laboratory provides highly complex testing in chemistry, coagulation, hematology, serology, micro biology and urinalysis. The Department of Pathology is a NYS licensed full service anatomic pathology laboratory that processes cellular samples and biopsies for microscopic examination and diagnosis plus a full array of cytopathology services, and molecular testing. Patient Centered Accountability, Quality, Equality, Accessibility, Respect, Teamwork, Collaboration, Cost-Effective.